Both are "Different by design"
Firefox, the open source browser, is being tested on Ouya, the open source game console, according to a software developer at Mozilla. "We're investigating what we need to do to make Firefox usable on Ouya," confirmed Mozilla mobile platform engineer Chris Lord to OuyaForum.com administrator Ed Krassenstein. "It already works and we have some preliminary patches for gamepad support, but there's still quite a bit of work to be done to make it really usable," said the Firefox developer. Lord, in finer detail, said that this includes making sure WebGL and Canvas support performs well enough on Ouya, and that relevant APIs like Gamepad API are also supported. Don't shout "Ouya!" in thinking that Mozilla is guaranteed to bring the Firefox browser to this US$99 Android-based game console. A company representative told TechRadar that "Mozilla is an open source organization and all projects and experiments at Mozilla are developed in the open to gather ideas and feedback." Lord, that one exploratory developer, further backed up the experimental status of Firefox on Ouya on Twitter. 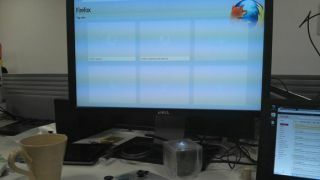 "#Firefox on #Ouya - kinda unusable atm," he tweeted along with a photo of the console sitting in front of a screen projecting the Firefox browser. The Kickstarter-backed Ouya is being toyed with by developers like the ones at Mozilla right now, as the diminitive console prepares to release to general Kickstarter backers in March. The Ouya release date for retail stores is currently pegged for April, with the official website still accepting Ouya pre-orders. The latest Ouya tech specs confirm that it will run a custom TV UI version of Android Jelly Bean, come with a much-needed-for-mobile gamepad, and pack a Tegra 3 system-on-a-chip. With a 1.7 GHz processor, 1GB of RAM, and 8GB of onboard flash memory, Ouya will have enough power to support Android games, all of which are free-to-play in some capacity. Raising more than USD$8.5 million (around £5.4 million, AUD$8.045) from Kickstarter, the second-highest crowd-funded project on the site, there are a lot of people betting big on this tiny console.